Not the most rigorous study, but it allows me to rationalize my recently-formed habit of eating 100 grams of Lindt’s 90% chocolate every day. Thomas, I also eat Lindt’s 90% dark chocolate every day — only one or two small squares though. I’d eat more, but can’t afford the calories. BTW I was personally offended when they discontinued the 93% cocoa bars!!! Most wonderful taste in the world IMO. Well, it is sugary, it is certainly not a starch. The sugar is added. Well reported! Thank you very much. Just wondering if you see any problem with the soy lecithin in some of the brands? No. Actually lecithin from almost any source is arguably a decent nutritional supplement (for choline etc). It is the proteins in soy that I’m most concerned about. Does this mean that lecithin contains no proteins? Or, that the soy proteins within soy lecithin are negligible? Should I be looking for chocolate without sugar? Bravo, very informative and witty. Delicious to read! Thank you. If you’re still monitoring this thread, sugar isn’t good for you, Soy lecithin, OK, cocoa butter okay. Try using straight coca. I’ve adapted to taste. Two tablespoons of cocoa to 8 oz. of water make a very drinkable hot chocolate. or use coconut milk straight or half-and half for a richer drink. I have noticed that my digestion worsens after having chocolate, by the way. Could it be the sugar? I get mild reflux (which I normally don’t get), and some burping and mild stomach bloating. I used to have some “GERD” symptoms (not so mild reflux, lots of gas and burping, and significant bloating – the lean man with a pregnant woman’s pending belly 🙂 ) That’s almost entirely gone away now with PHD and supplements and micronutrient rich foods, but chocolate brings it back. Any ideas? Suggestions? Get 100% and use stevia leaves if wanting sweetening? The highest% organic chocolate I can find here is 80%. I used to have some “GERD” symptoms (not so mild reflux, lots of gas and burping, and significant bloating – the lean man with a pregnant woman’s pending belly 🙂 ) That’s almost entirely gone away now with PHD and supplements and micronutrient rich foods, but eating chocolate brings it back. but, from what i have read (there a few studies on pubmed), some methylxanthines, such as theobromine and caffeine, may relax &/or weaken the LES (lower esophageal sphincter) muscles. & guess what, theobromine and caffeine are found in dark chocolate. i gave up dark choc & my night time reflux (silent reflux) went away eventually…may or may not have been related. but you need to give it time to test, because the mechanism (imo) is that your LES muscles need time to recover/strengthen. Hm, thank you! 🙂 Very happy to hear about and see re: the mechanisms of that. I’m curious whether you tried eating your chocolate towards the early hours of the day, and whether that made any difference. Thank you – that’s very useful! Yes i did. at one time i was eating too much dark choc & i also knew it contained caffeine. so i decided to stop eating after 3pm. This did not seem to have much (any?) effect by itself. …But note i did Not suffer from reflux after eating. I self-diagnosed that my issue was more ‘posture relate’ ie. as long as my torso was upright (seated or standing) i was fine. so hence i concluded a weak LES could be my issue. so i stopped the dark choc. i was not a coffee drinker. i may have stopped drinking tea (not sure), tho i am currently not drinking tea, i just kinda stopped a while back. non-phd alert > i also stopped drinking sugar free caffeine & guarana energy drinks. & after a few weeks my issues went away, maybe 100% by 2 months. Now, after a few weeks of giving them up i had started doing the occasional sugarfree caffeine&guarana energy drink again. & now (Paul, cover your ears) i am back drinking the sugarfree energy drink as before. But have never eaten dark choc again. so the caffeine (& guarana) in the energy drink has not caused me any issues. Now that I think about it, I wonder if you experience – or have heard of anyone else experiencing – reflux with tea or coffee. 🙂 That’s very interesting indeed. This also makes me wonder: if the LES is weakened by methylxanthines in coffee/tea/chocolate, are there significant negative endpoints (diseases or problems) which show up in conjunction with the positive endpoints (such as reduced heart disease, increased mental acuity…) in heavy chocolate eaters/tea drinkers/coffee drinkers? More GERD? Esophageal problems? My wife had to give up chocolate and coffee due to GERD issues. Takes time to heal the esophagus and build muscles back into the LES, as previously mentioned. I had no issues with GERD, but gave up chocolate and coffee because they worsened my hypothyroid symptoms. I’m not sure if it was from disruption of circadian rhythms or more direct, but quitting them also improved my mood. Seems that what goes up must come down, and I came down pretty hard and got cranky then depressed. I keep telling myself this is thyroid related, and that when it’s fully recovered I’ll be able to indulge again, but… reality has a pesky habit of interfering with fantasy. We’ll see. My TSH is creeping down very slowly. So, would you say the higher the cacao count, the better? I found a brand that’s 98 % cacao sweetened just with stevia. It’s intense! Equal quantities of cacao butter,coconut oil and cacao powder (more or less cacao powder to taste) plus vanilla. Put cacao butter in a bowl in a pot of simmering water (no lid on) and allow to melt. Add coconut oil then when both are melted add the cacao powder and vanilla. And macadamia nuts chopped for the de luxe version. I mix it together with a hand egg-beater but I suspect you don’t have those in the U.S. so a whisk should do. Put it in trays and, when it has cooled enough, put it in the freezer. Cut before it gets too frozen and then keep it in the freezer. For wimps and the uninitiated, I do a small tray with a little honey added, but I am sure rice malt would do the job. The true chocaholic rapidly adapts to the non-sweet version (tested on family and friends) although the coconut oil takes off the edge and makes the switch to sugarless easier. Good idea to use organic ingredients unless you want to increase your lindane levels and contribute to a very low standard of living for workers on cocoa plantations. Should these not be considered toxic? 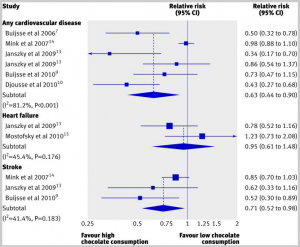 Does chocolate/cacao fall into the category in which “the dose makes the poison”? 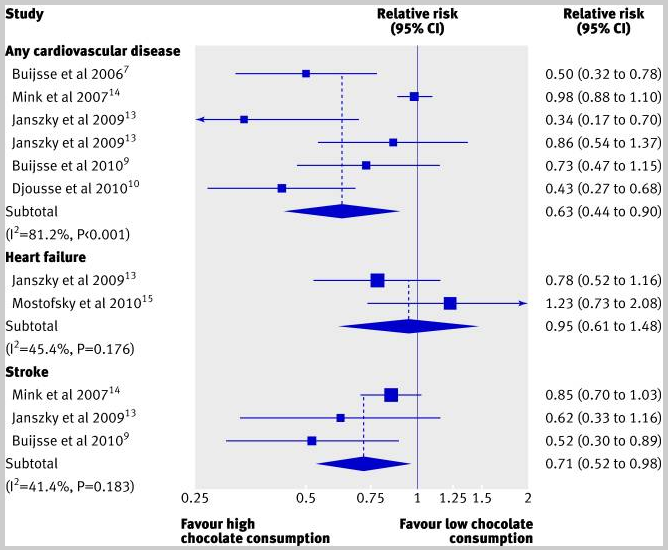 Chocolate addiction aside, we must remeber that correlations like the one above, does not mean causation. Swiss chocolate might have a lot of sugar, 10kg of sugary or not so sugary chocolate might be consumed, but whether than is (dare I say it) thrown away or added into desserts or shipped abroad, it seems unlikely that that that much dark cholocate is being consumed. Indeed the dose is the poison, same thing for coffee. It seems that a rotation perfect health diet, would give you the most benefits with the least stress on the body, particulary for allergens. 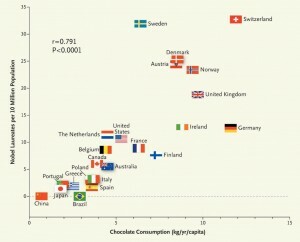 Let’s also be honest, who can afford 30g of quality chocolate a day, except perhaps noble laureats? Get its beneficial amount of magnesium from a supplement and copper from liver. I understand the benefits of Cacao and I consume a small amount of raw cacao powder each day in a smoothie, however I’ve recently read information (Weston Price) which claims that cacao is high in phytic acid, and therefore stops our body from absorbing the essential nutrients that the cacao contains, not to mention any other nutrients in my smoothie too! I’m currently pregnant and following your diet and like the idea of having a low phytic acid diet. What’s your take on this? Does cacao contain phytic acid and if so does this mean we should comsume it alone without other foods? Naturally occurring phytate is usually already bound to minerals and so it doesn’t tend to chelate much else. When it does, it is often beneficial, as when it helps relieve iron excess in men or postmenopausal women. I wouldn’t worry much about it, if you are well nourished the small changes introduced by a bit of phytate won’t matter. Remember the peak health range has a flat top so you have some leeway with no impact on your health. I’m not big on chocolate, but have been buying Trader Joe’s ‘Pound Plus’ 70% bars because they’re a good deal. They’re 70% cocoa solids, so 3 squares of it – about 39 grams, would be in line with a good daily dose and provide 25 grams of cacao solids. But lately I’ve been using raw cacao powder instead. From what I read, raw cacao can have about 8 times the ORAC value of processed cocoa, so I just use about 3 grams of the powder in water when I take some of my other supplements in the morning. First make a paste with just a bit of water, as you would cement mortar, and then add the rest of the water once you’ve wetted all the powder. By the way, Trader Joe has another product that those of you who aren’t chocoholics might like…’Coffee & Cocoa’ in a 12 oz. can. Really tastes great, I think. Coffee lovers should like it. As you should know, correlation does not equal causation. Another factor is likely driving both, which is likely per capita income. 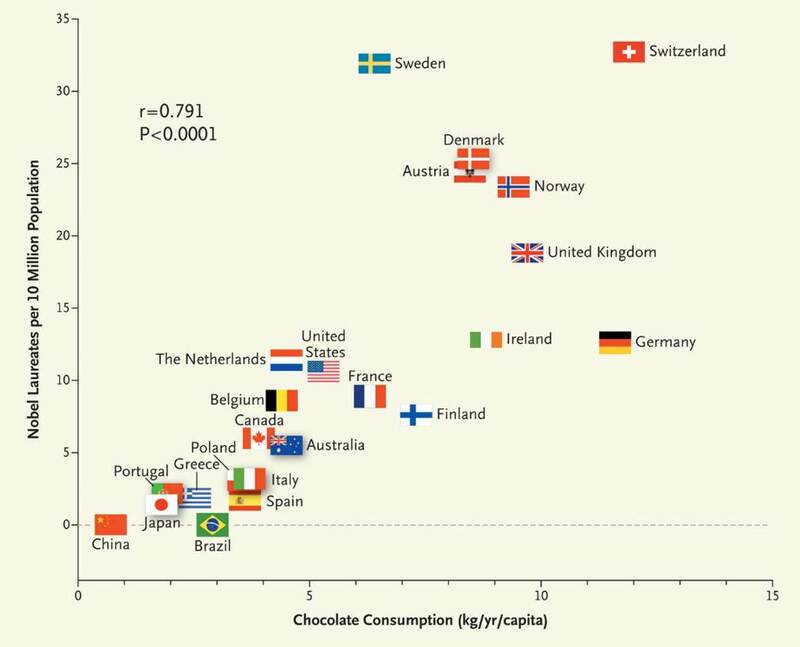 Countries with higher per capital income on average have higher chocolate consumption, and also greater investment in science. I think it’s tongue in cheek… I don’t think Paul really believes the chocolate-Nobel prize hypothesis. The implication would be that Scdndinavians are more intelligent than, say, Mediteranneans and that this is down to chocolate consumption! As an economist, Paul would probably agree with your more plausible theory. Although thay wouldn’t explain why the Japanese have won so few Nobel prizes. Perhaps cultural reasons also play a part. I’d bet that the Japanese win fewer Nobels because they think very well inside the box. The Japanese are too conventional thinkers by your estimate? You’re actually serious or is this like residual Pearl Harbor angst?